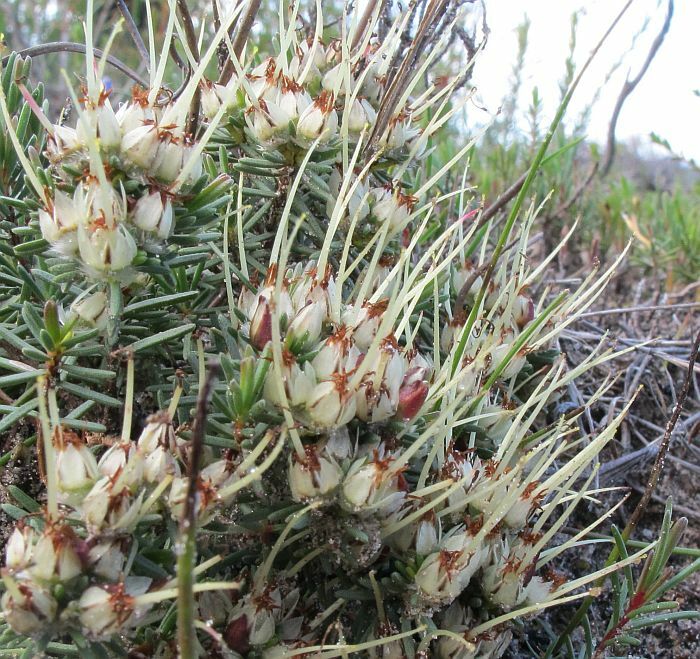 This unusual looking plant has confused a number of botanists, especially those who have tried to classify it. 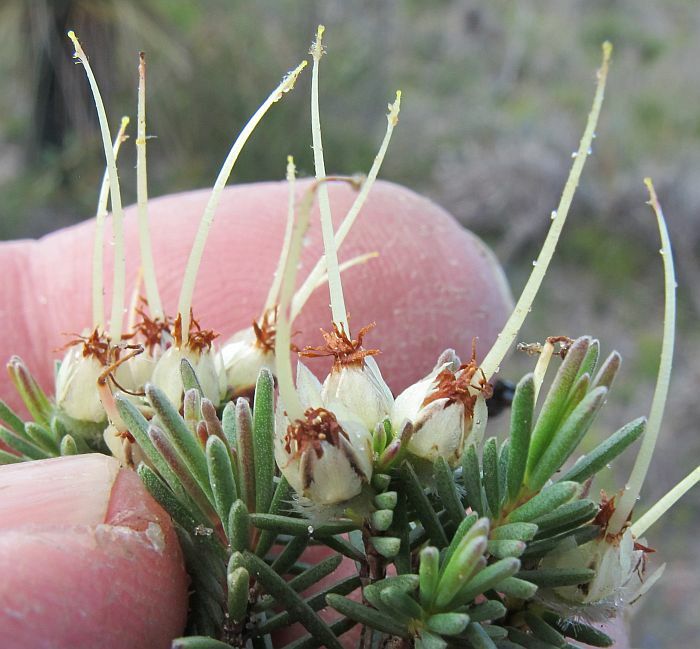 Initially it was included in the Chamelaucium genus, but later transferred to Darwinia where it remained for well over 100 years. 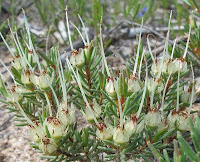 It was eventually placed in Verticordia when Alex George revised the genus in 1991. However I must admit, when I first saw it, I too thought it might be a Darwinia as they mostly have undivided sepals and petals, plus a long style. 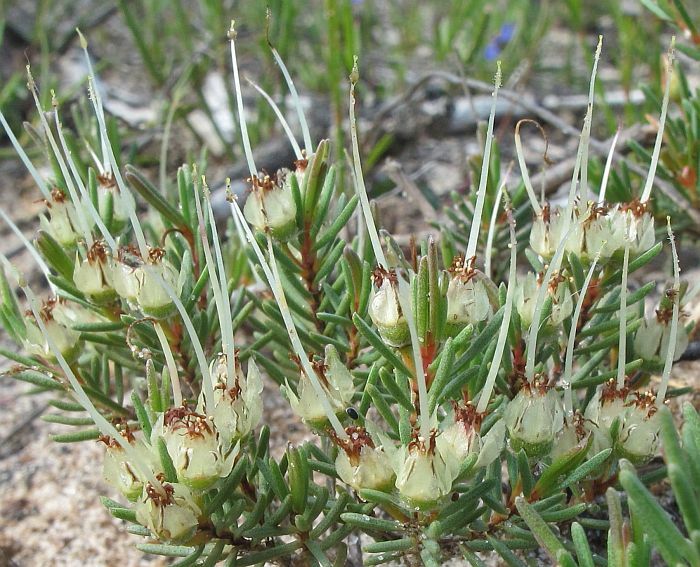 Verticordia verticordina is a rare species, restricted to the east of Esperance, mainly between Cape Le Grand and Cape Arid (90 km or 55 miles apart). 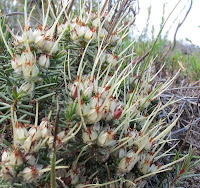 The colony I happened upon, was growing after a bushfire at the base of an exposed rocky outcrop flanking Mungliginup Creek about 80 km (50 miles) from Esperance. 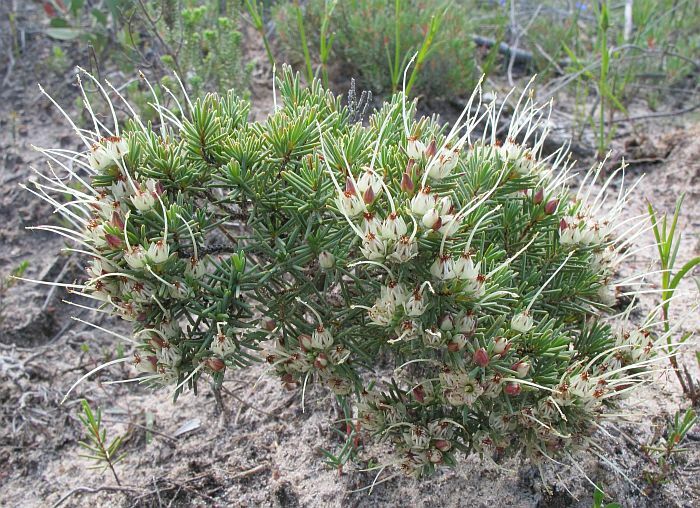 The Verticordia habitat was formed by clay materials eroded from the rock, then covered by wind-blown non-calcareous sand, which would receive additional moisture from rainwater run-off. 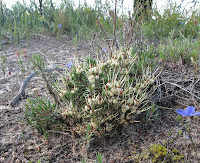 There were 20 or so very localised plants, however this habitat is not uncommon in the district and other colonies are also likely to occur. 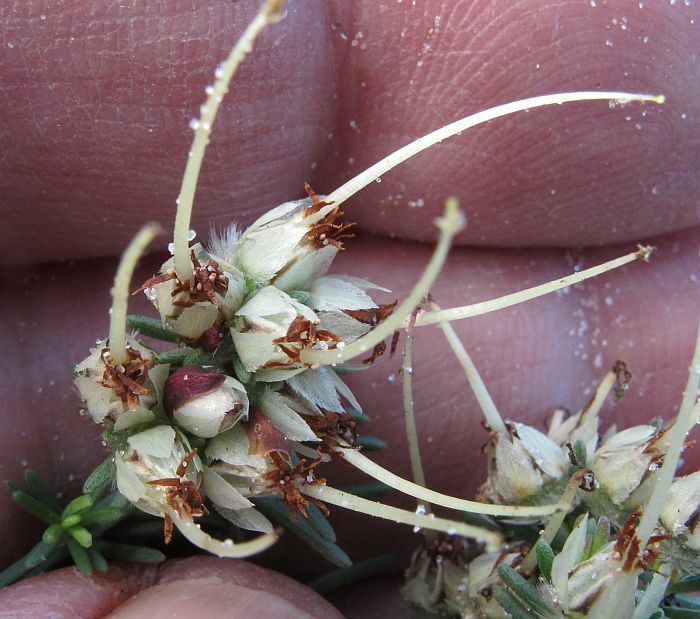 With such a limited distribution, this species has a Priority Three, Conservation Code rating, meaning it is only known from a few locations and in need of further survey. Verticordia verticordina can be prostrate or grow as a small shrub to 30 cm (1’) in height, the flowers are a pale green and although only opening to 5 mm (under ¼”) diameter, each has a style over three times this in length and whilst not being spectacular to look at, they do have character. 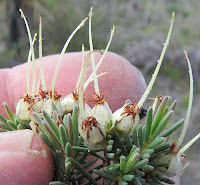 The golden brown strips at the base of the style are staminodes with similar alternating but shorter stamens. Flowering is recorded from August to October, but are also known to bloom at other times, which would probably depend on good rainfall and seepage from the rocky slope.